A social Media Meetup which is one of the most exciting event around the world organizing by Mashable. Mashable launched this event for the first time in 2010 for the revolution of the happening around the world. 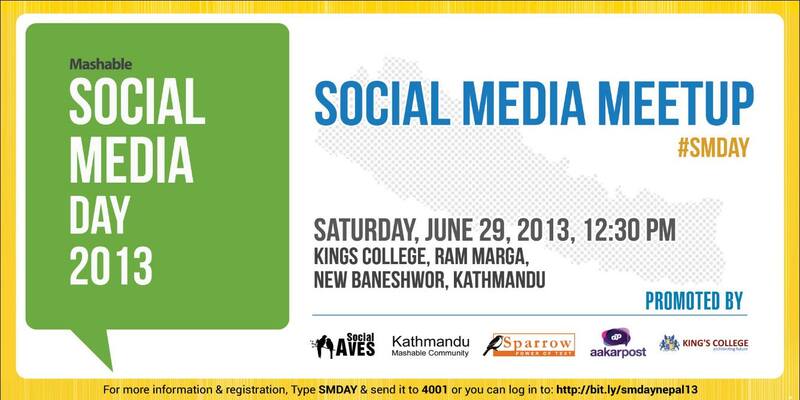 In Nepal, there has happened for the 3 times and this year it’s the fourth annual Social Media Day which is going to happen on 29th June (Asar 15), Saturday. The theme of this year will be “Social Media is Good”. The major role in changing the fortune of many people, communities, brands, companies and countries are now totally dependent on social media networks. In this Meetup, you may find the base for discussing what good Social Media has done in different sectors in Nepal, how people are using Social Media. An expert from different fields (Marketing, Journalism, Education, Literature, Movie, Music, Sports, Campaigner etc) will share how Social Media has helped them to achieve their goal in their field. If you’re a Social Media enthusiast, we suggest you not to miss this exciting opportunity.